Former Phoenix mayors Paul Johnson, Skip Rimsza and Phil Gordon at the home Frank Lloyd Wright House built for his son in Phoenix. 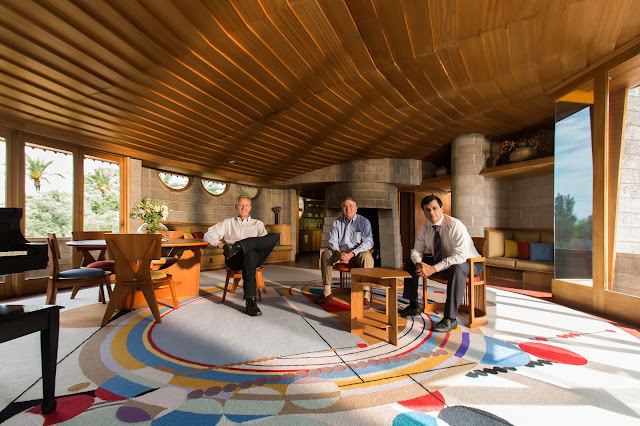 Wayne Rainey was recently called upon to photograph former Phoenix mayors Paul Johnson, Skip Rimsza and Phil Gordon at the home Frank Lloyd Wright House built for his son in Phoenix. In May 2012, Phoenix nearly lost this architecturally significant historical home — the David Wright House in Arcadia. In 1950, Frank Lloyd Wright designed the home for his son David on 10 acres in the middle of citrus groves with magnificent views of Camelback Mountain and Papago Peak. Completed in 1952, the David Wright House is one of three spiral designs by Mr. Wright. It is a precursor to the Guggenheim Museum in New York City. The house is regarded as Mr. Wright's last residential masterpiece. It is an architectural jewel, but until recently very few knew it even existed. Continue Reading on Arizona Central.